Not too many moons ago, Tito Ortiz became the pillar of the light heavyweight division while establishing himself as the bad boy of mixed martial arts. In fact, you can practically say it’s his middle name. Fast forward to 2010, where the 35-year-old finds himself on the outside of the Octagon looking in. “The Huntington Beach Bad Boy” holds a respectable 15-7-1 record, however hasn’t won a fight in nearly four years. The controversial wrestler has posted a disappointing 0-3-1 mark over his last four outings and hasn’t been seen since Forrest Griffin handed him a split decision loss at UFC 106. While his recent performances haven’t been anything to write home about, Ortiz claims it’s because he hasn’t been healthy. 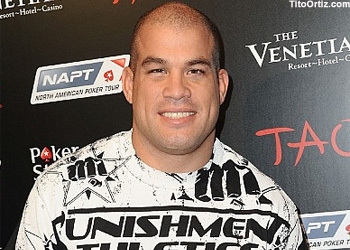 After undergoing two major surgeries to alleviate his discomfort, Tito Ortiz is back, baby! “Two things that don’t hurt though; my lower back and my neck,” Ortiz stated in a recent video blog. “It’s gonna be easier for me to get in shape this time too because I haven’t partied in so long. No drinking alcohol, no more going out and getting crazy anymore. Although most would argue that it’s ALWAYS been about Ortiz and his agenda, Mr. Jameson understands that he’s currently short stacked at the light heavyweight table. Despite claims of wanting to fight for another five years, making him 40 by the time he hangs up his MMA gloves, Ortiz understands he needs to go all in now before someone forces him to cash out later.